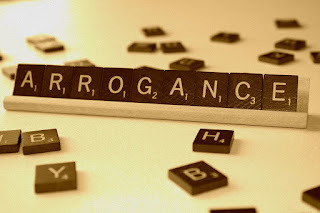 Kent's "Hooligan Libertarian" Blog: Who's calling whom "arrogant"? They are thinking in terms of their ego, categorizing themselves into some sort of demographic and arguing; 'My way by force' and contextualizing everything in terms of opinion, answering 'which force is best'. When they hear you preaching from your soap box, they interpret it as your opinion to be forced against 'their way by force'. Libertarianism is based in reality and the value of life, real universal truth and ideas. Government says 'reality shall be this/that by force', whereas libertarianism says 'this way because it just is, that's the way reality works and what humans are'. They are trying to rationalize and opine faux-reality by force while you are trying to explain reality and how to work with it. It is like them arguing that you are arrogant because you do not agree that 2+2=5 is the best of the answers. It isn't a matter of "best". It is either correct or incorrect. The answer is four, everything else is wrong. Which temperature is best to freeze water? People opine that it needs to be 40 degrees so their freezer works more efficiently, therefore resulting in lower energy use and cost and environmental impact. In order to make that work, it has to be officially sanctioned and forced, and life/reality must bend as to accommodate various rationalizations. They come up with ideas such as "Liquid Ice" for freezers made before the mandated new temperature settings. All new freezers now freeze water at 40 degrees. They even make a separate special and unique temperature scale for freezers. All mandates are to be done by that standard. Water freezes at 40 Degrees Appliance Temperature (often called 40 AT) Children grow up learning that appliances work differently than the rest of the natural universe. Kent and the gang come along and say "Water freezing point is what it is because that's how water works, regardless of what you call it or how you measure it. Your freezer still has to work just as hard to make it freeze. If you want to make your freezer more efficient, redesign it with more efficient components"
Some idiot responds "I disagree". the 40AT lobby group buys off a few congressman, and they pass media and internet laws against "hate speech" and "temperature deniers". online companies lock out your websites and documents, activists violently tear down statues and ban books not purged of historical demons like fahrenheit, celcius. manufacturing plants of the old refridgerators are punished by banks and government agencies; millions go un-employed. GM and elon musk get HUGE subsidies to build the new "correct" technology, and to hire plenty of "right thinking" friends and relatives of the self annointed gods. soon everything costs twice as much, doesnt work, and well meaning polite people form a "refridgerator party" to try to fix things. the media humiliates them, encourages violence against "temperature clingers", businesses throw such people off of office, off the board, and proclaim they never knew that such a person was hiding among them. government agents investigate tbem, agencies crush them in fees and fines and process. bureacracy eats the hostage population. as always, darwin prevails, and yet another system of brutal slavery is added to the dustbin of history. universities get billion in federal grants to develop "refridgerator warming models", to prove that everyone will die,freeze,starve,boil unless goverment gets control of all industry,power,money,sunshine,carbon- and compel the fools to see the beauty of their model. actual data is tossed out. disney makes movies about princesses and dying polar bears. sports channels stop covering sports, to fixate on "temperature privilege" killing the ice cubes. i sit back, enjoy my beverage, and cheer for darwin. then again, even freezing water is confusing . Is that either correct, or incorrect?